"Poseidon the Sea God, -Enemy of Odysseus,"
The Miriam and Ira D. Wallach art gallery was established in 1986 for the students and faculty of Columbia University. It is located on its campus at 826 Schermerhorn Hall, home of the department of Art History and Archaeology. I didn't realize it was open to the public until I saw write up in the Columbia Spectator about it's current show, “Romare Bearden: A Black Odyssey”. The gallery is tucked away on the 6th floor of the building. This was the first time that I was seeing this body of work and it felt like discovering a new treasure. The exhibition is comprised of, collages, watercolors and drawings depicting scenes from the classical Greek poem, The Odyssey. In this series of collages, Bearden re-tells the story of the war hero Odysseus trying, to find his way home while infusing it with African imagery and allegory. For example the Greek god Poseidon is depicted with an African mask in "Poseidon the Sea God,-- Enemy of Odysseus," 1977. His signature style of combining glossy clippings from magazines along with colored papers and cloth does not appear in this series. Instead he cut out vibrantly colored papers and layered them to form images in a style that references Matisse’s cut outs. 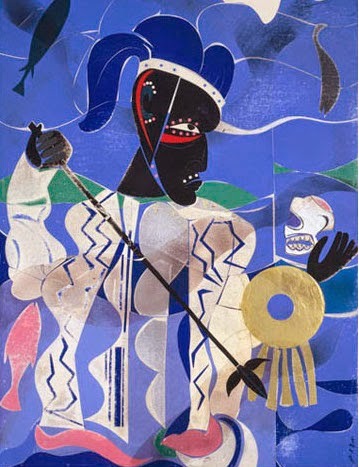 Romare Bearden connects the narrative of the African diaspora with the theme of human displacement that occurs across cultures and history. Your teens who are studying Greek literature will especially appreciate the narratives that they have read come to life in these images. This exhibit is up until March 14, 2015.